Electric Universe: The Three Suns of Kristian Birkeland. I. In the early 1900s, electromagnetism had reached the level of a well-understood phenomenon, particularly after it was placed on a firm mathematical foundation by the work of Maxwell. Many researchers were continuing to explore the nuances and predictions of these equations, applying them to different Earth-based as well as cosmic problems to see if they yielded any insights at the level that Newton's gravitation did for celestial mechanics. Some of the more interesting experiments exploring cosmic electromagnetism were done by Kristian Birkeland in the early 1900s. Birkeland documented these experiments and his other ideas in his tome The Norwegian Aurora Polaris Expedition (which I will reference as NAPE) which was published in two sections. Section 1 was published in 1908 and deals largely with the aurora expeditions and observations as well as Birkeland's initial terella experiments. In Section 2, published in 1913, Birkeland attempts to expand the scope of the interpretation of his experiments. As a consequence of Birkeland's work with the aurora and the laboratory terella (which I will explore in a future post), Birkeland explored a number of ideas about the nature of the Sun. Birkeland speculated that sun was powered by the decay of radium (NAPE, pg 314, 670). It was not a new idea and it did not originate with him, as the question of the energy source of the Sun had been a long-standing problem. With the discovery of radioactivity, the question of the heat source within the Earth was thought to be solved (1907JRASC...1..145R). The term 'transmutation' was apparently first used (with some trepidation) in 1901 by Rutherford and Soddy in describing nuclear decay of thorium to radium (Wikipedia). Beyond nuclear decay, other nuclear reactions such as fission or fusion were not yet known. The first artificially-induced nuclear reaction would not be discovered until 1919, by Rutherford, and after the death of Birkeland. Birkeland mentions Rutherford's ideas that in the solar interior, that ordinary matter may become radioactive (NAPE, pg 315). However, in reading NAPE cover-to-cover, I found no use of the term 'transmutation' at all, much less in context of nuclear reactions. These speculations on the solar energy source may have been the motivation of spectroscopic searches for radium in the Sun common around this time. However, a number of other elements such as iron, titanium, and lanthanum had spectral lines very close to those of radium so the status remained unclear for some time (1912AN....192..265M, 1912Obs....35..360E, 1913PA.....21..321M). Eventually the spectral measurements become sufficiently accurate to conclude there was no significant amount of radium in the Sun (1929ApJ....70..160S). 1) Photosphere is cathode & anode located below. "In the first place, it might be imagined that the interior of the sun formed the positive pole for enormous electric currents, while perhaps the faculae, in particular, round the spots, formed the negative poles." "Or it might be imagined that the positive poles for the discharges were to be found outside the photosphere, for instance in the sun's corona, the primary cause of the discharge being the driving away of negative ions from the outermost layers of the sun's atmosphere in some way or other for instance, as ARRHENIUS has assumed, by light-pressure after condensation of matter round them." Note that Birkeland introduces this model with 'or' to label it as an alternative to model 1. "Finally, it might be assumed and this, according to the experimental analogies, seems the most probable assumption that the sun, in relation to space, has an enormous negative electric tension of about 600 million volts." Models 1 & 2 are clearly different, placing the anode on opposite sides of the photosphere. It might be tempting to consider 2 & 3 as the same model, with the anode just further away in model 3, but model 3 places Earth IN the space of the anode, which has stronger implications for measurements near Earth not possible in model 2. So Birkeland describes three different cathode-anode configurations for an electromagnetic solar model. All the models keep the cathode at or on the solar photosphere, perhaps at sunspots. The anode is proposed at three possible locations: inside the sun, just above the photosphere in the corona, and further out in interplanetary space. The final configuration is apparently favored by Birkeland, probably for its similarity to his terella configuration. Of course, since these configurations all have a common cathode, it might also be possible to consider combinations of the anode positions: 1+2, 2+3, 1+3, 1+2+3, analogous to the multi-grid electron tubes (Wikipedia) used in the first half of the 20th century, providing up to seven possible configurations. Each one of these configurations would require a different analysis as the each has different implications for where and how we can make measurements. K. Birkeland. Sur la source de 1’eleclricite des etoiles. Comptes Rendus Hebdomadaires des Seances de l’Academie des Sciences, T. 155:1467–1470, December 1912.
but the description in Science Abstracts seems to be mostly based on some of Birkeland's experimental configurations. "According to our manner of looking at the matter, every star in the universe would be the seat and field of activity of electric forces of a strength that no one could imagine. Each one of these models above have the same problem: How is the electric potential maintained? In model 2, Birkeland suggests Arrehenus' idea of electrons driven out by radiation pressure might help maintain such a voltage. However, other researchers, such as Milne, Rosseland, Panneokeok and others explored the voltages possible driven by particle speeds, but the predicted voltages turned out to be FAR lower than Birkeland needed. Rosseland also explored mechanisms for generating currents in sun for solar magnetic field (1925CMWCI.302....1R). In part II of this post, I will go over some of the other problems associated with Birkeland's solar models, some of which were apparently recognized by Birkeland. No comments supporting the Birkeland solar model will be posted to these comment streams unless the commenter can provide correct numerical answers to at least half of these questions. Actually, if they are competent enough to answer half of these questions, which are at the level of high-school physics, they should be able to answer all of them. If it starts from rest, what is the final speed of an electron accelerated across a potential difference of 600 million volts? If it starts from rest, what is the final speed of an proton accelerated across a potential difference of 600 million volts? Given a cathode at the photosphere and an anode in distant space, which way do the electrons go in this potential? Which way do the protons go? What is the speed of the solar wind? How do the speeds found above compare to the solar wind speed? What voltage is needed to accelerate protons to the speed of the solar wind? What voltage is needed to accelerate electrons to the speed of the solar wind? How do these voltages compare to the 600 million volts of Birkeland's model? Is the Birkeland model consistent with these measurements? Birkeland used a potential between 10,000-20,000 volts in his terella (NAPE, p 151, 553). Here are some questions related to the parameters of these experiments. How much speed does an electron obtain in this potential difference? How much speed does a proton obtain in this potential difference? What is the mean thermal speed of electrons and protons due to temperature in lab (say 60F?). Does the electric field overpower the thermal motion? What is the air pressure in the terella? The atomic density of the air in the terella? What is the mean-free-path for atoms in the terella at operating pressure? K.R. Birkeland. The Norwegian Aurora Polaris Expedition. 1902-1903. Section 1, volume 1. 1908. K.R. Birkeland. The Norwegian Aurora Polaris Expedition. 1902-1903. Section 2., volume 1. 1913. A. Egeland and W. J. Burke, editors. Kristian Birkeland, The First Space Scientist, volume 325 of Astrophysics and Space Science Library, May 2005. Every once and a while I receive emails and/or comments accusing myself (and/or others who choose to engage pseudo-scientists), of arrogance. That occurred in the comments to the previous post. In addition, I recently stumbled across some notes for a response to a previous comment expressing similar sentiments. Suric: it takes arrogance, lameness, utter self love and desperate need to be in the limelight, to come up with an idea which allows one to erase, in one stroke, anyone's attempt to question and correct. These are the types of responses when opponents don't have any actual facts to back them up. Who is more arrogant, those who actually plan, build and operate these missions, or those who claim they can who have not demonstrated that they can do even the basics (like calculate spacecraft trajectories, compute particle fluxes) and going so far as to claim that those who CAN do these things are 'faking the data', 'lying to protect the status-quo model', etc.? I'm not a research-grade scientist. However, thanks to a rather broad training in physics that I obtained as an undergraduate and graduate student, I am a sufficiently good generalist that I can do support work with sufficient accuracy and reliability to aid those who actually do research. I'm quite happy with that. I've been criticized, told I was wasting my time, by professional scientists, for being willing to deal with the cranks and crackpots. Though there are others who've actually thanked me for addressing some of the problems created by the cranks. If I'm doing this to get attention for me, I'm clearly doing something wrong. Meanwhile, many pseudo-scientists attempt to harass professional scientists (the more prominent the better) in an attempt to raise their profile. Since the pseudo-scientists can't meet the standards of REAL science, this is probably their only actual accomplishments. ...to come up with an idea which allows one to erase, in one stroke, anyone's attempt to question and correct. What most cranks, pseudo-scientists, and their supporters fail to address, is the faults in their claimed 'corrections' to the 'status-quo' model. I've yet to find one of these 'corrections' that has less severe problems than the mainstream problem they claim to correct. Consider the Standard Solar Model. That model, as it exists today, has been developed over the past 100+ years with contributions from hundreds of individuals. While there are a few stand-out names among the contributors: Cecilia Payne, Henry Norris Russell, Hans Bethe, etc., most of their names are lost to all but those who work actively in the field. Among pseudo-scientists, there are as many theories as there are ego-maniacs. As I have noted before, there are, at minimum, FOUR separate, and outright contradictory Electric Sun models pushed under the "Electric Universe" banner by as many individuals, as well as loads of others lesser known. You see similar behavior in young-earth creationists, where different 'centers', ICR, CMI, AiG, etc. may utilize the same 'problems' in mainstream science, but often advocate different solutions to the problems, usually oriented around the products which they wish to sell to believers. What is the standard for 'winning'? While each of these EU or creationist 'researchers' has their own fan club, how many other individuals are actively involved in research on any of these models, as opposed to pushing another radical variant of their own? But the really funny part which Electric Universe supporters is even with just these four 'Electric Sun' models are so radically different from each other that the proponent of any one of them is calling all the others nonsense. Yet not only have EU 'theorists' not provided details of these theories with numerical predictions of these claimed 'successes', we have yet to see how any of these models can provide predictions of the particle environment around the Sun where we routinely fly spacecraft. "It is up to mainstream science to prove our theory." So it appears EU 'theorists' want mainstream scientists to do the actual hard work while EU theorists hang around to take the credit? And we still get no 'correct' calculation. Yet while Electric Sun advocates claim these 'corrections' to the Standard Solar Model explain many problems with the model, we have yet to obtain any useful quantitative predictions from these models which we can compare to actual experiments and observations. And many of these failures of these 'corrections' are things which the Standard Model does well (see also Challenges for Electric Universe Theorists). Pseudo-science 'models' claim to explain everything, yet can predict nothing except in the most ambiguous fashion, more like the predictions of a tabloid psychic than real scientists. "While orthodox science has had its share of egomaniacs, unorthodox science attracts even more." EU has never even demonstrated that they understand enough about celestial mechanics to model an interplanetary trajectory as it is developed by the professionals, much less demonstrated that they can model a similar trajectory in a solar system awash in regions of significant charge which they claim exists. Yet they still claim they are the geniuses and insinuate the people who actually do this stuff are everything from incompetents or liars. In legitimate science, we conduct experiments and work to make sure they have results that are reproducible, and predictable. This practice has made possible technologies that were not possible one hundred, or three hundred years ago. It is because we now understand, in reproducible mathematical detail, behaviors of atoms and electrons at the atomic scale (making possible the computer on which you are reading this) to the motions of objects in distant space (making possible space missions to the outer reaches of our solar system). Sometimes this means there are some problems to which real science does not have an immediate answer, which are an ongoing area of research. Sometimes the answer to the problem requires a revision to what we previously thought we understood well, but there are rigorous procedures for making that determination. On the other hand, pseudo-science is based on the idea that the Universe must conform to the expectations and/or 'worldview' (i.e. political and/or religious ideologies) of its advocates (see Pseudoscience and 'World-View'). In this model, pseudo-scientists claim they can 'explain' any problem which exists in mainstream science, often at the expense of ignoring well-established science. Considering how many different (and competing) 'worldviews' have adopted some form of pseudo-science, or adopted some fact of established science to attack, statistically, what are the odds for ANY of them being correct?! Which system requires more arrogance? With the recent Electric Universe 'conference' in Phoenix AZ, I just had to do a little browse over to the Thunderbolts forum to see if there were any interesting threads related to it. While not directly related to the conference, there was one interesting recent thread, started by user Metryq, that died a quick death. Thunderbolts Forum: Space Sim with EU? There are many space sim/planetarium apps to choose from. Some are "Earth-bound" while others allow one to tour the Solar system, or farther. Many of these apps are like interactive textbooks, delivering only the mainstream view of astronomy. Some apps, like Celestia (which seems to have fallen out of development), permit mods and add-ons and interactive lessons. Is anyone aware of an app that includes EU material, or perhaps a multi-platform app that would accept an EU mod/lessons? Thunderbolts is promoting EU extremely well, but a space sim might be one more avenue to explore. The short answer for Metryq is that there are many simulations involving electric fields in space. But those simulations just don't demonstrate what Electric Universe supporters claim they would show. Because if they did, this could have been done a LONG time ago. Computing power is more than up to the task of doing this. Many of the papers on REAL electric effects in space I've documented elsewhere on this blog. The Real Electric Universe: Inspired by Velikovsky? Could this be NASA coming round to the EU model? Now many of these simulations are not that difficult to write. I wrote my first gravitational n-body simulation back in 1979 on an Apple II computer (Wikipedia) using AppleSoft Basic. All it requires is a good understanding of the necessary mathematics and physics, and access to a sufficiently powerful programming language. In terms of programming languages, C and C++ are good if you want the better speed of compiled languages. Python now has extensive scientific libraries and graphical support and is my language of choice when speed is not critical. I've written numerous other simulations since then. More recently, I've written some 2-D plasma simulations and even an n-body particle code that combines gravity and electromagnetic forces. 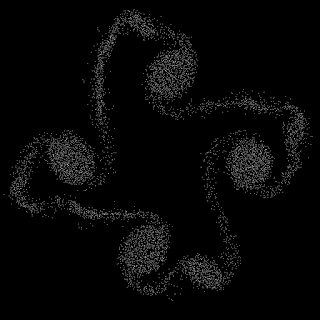 Doin' Real Science: Simulating Particles. Near the bottom of this post is an example what can be generated by interfacing the output to a more polished rendering system like POVray. Geocentrism & the Barycenter. II. Sample from from one of my 2-D plasma simulations of a ring Birkeland current in a magnetic field flowing perpendicular to the plane of the image. Electric Universe: Real Plasma Physicists Use Mathematical Models! Electric Universe: Plasma Physics for Fun AND Profit! So why aren't there similar simulations for Electric Universe models? If the Electric Universe 'theorists' were as smart as they want their fans to believe, they would have been able to demonstrate this YEARS ago, yet the only models that looked even encouraging, failed many other tests (see Scott Rebuttal. II. The Peratt Galaxy Model vs. the Cosmic Microwave Background). The bottom line is these simulation programs don't exist because Electric Universe claims of gigantic currents powering stars and galaxies and etching canyons and craters on planets just doesn't work. General list of failures of Electric Universe models.